The short story “The Broken Heart” is now available on Amazon.com. Zach has a broken heart. He moved down to Florida to retire, restore a boat, and get over the death of his husband. However, restoring a boat is easier than mending a broken heart. He finds the dark waters of the Big Cypress River run deep and you can find family, home, and new love in unlikely places. Of course, a bit of vodou and the nudge of a ghost can always move things along. 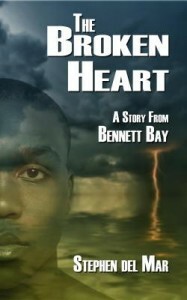 The Broken Heart is part of Stephen del Mar’s Stories from Bennett Bay collection. For those of you who enjoyed “The Three of Us,” this story tells how Zach and Detective Stan Wolf meet. The Broken Heart and other things. Congrats StephendelMar! I’m very proud of you. Thanks! How is life in Ireland? Previous Previous post: Pulp-O-Mizer: Fun ways to waste time!